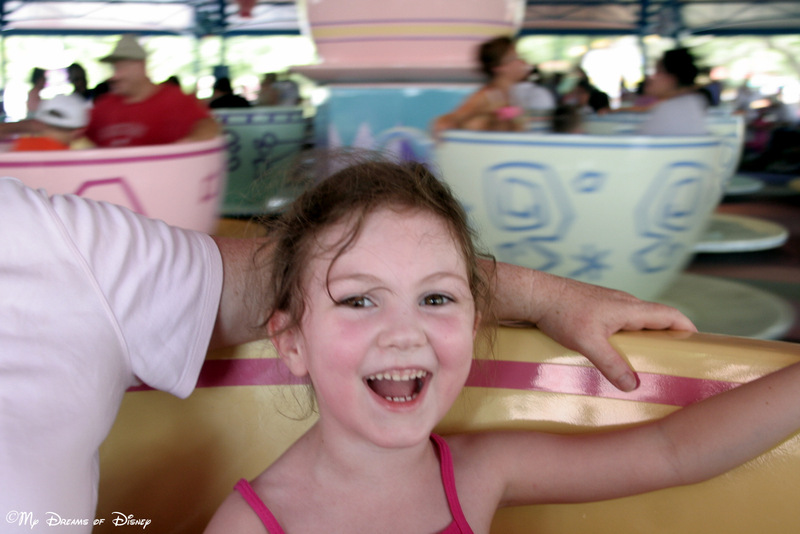 Wordless Wednesday - Disney Letter "H"
Happiness is riding the Mad Tea Cups with your Mommy and Daddy. Such excitement in Sophie’s expression! Happiness…simply put, it is one of the most powerful words in the spoken language. How happy a person is can be determined by many factors; work, school, life circumstances, your relationship with God and family, they all play a role. Today’s Wordless Wednesday theme is the Disney Letter “H” — and for me the singular word that accompanies that letter is…happiness. Many of you will have seen some of the pictures before — it’s certainly not rocket science that I’ve used them before — but when you hit upon a moment, a memory, an expression that fits the thought to a T, well, you use that memory for all it’s worth. Enjoy my journey as I share with you the moments of pur happiness that we’ve experienced at Disney. 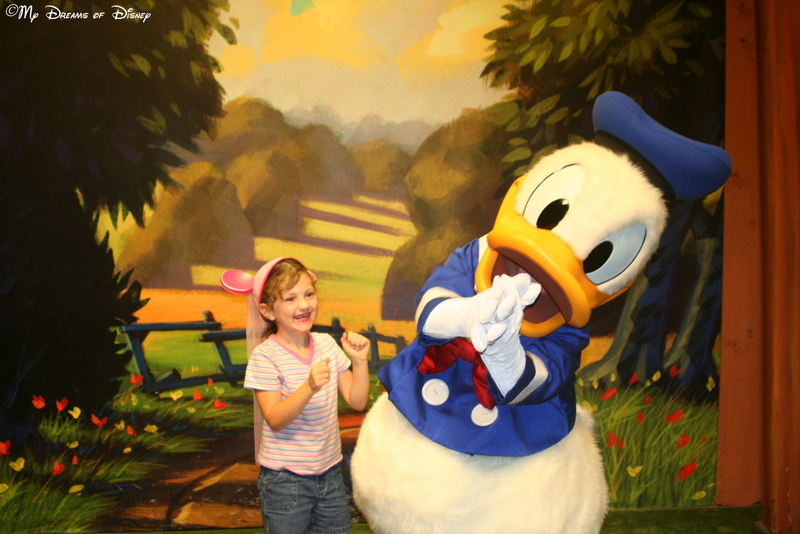 On this day in 2007, Sophie was so excited to see Donald Duck that she started dancing — and he joined in! The happiness in Sophie’s face — and the way she started bouncing and dancing along with Donald — is a treasured memory that I will never forget. Happiness isn’t just evident on the faces of Guests — take a look at the smile on the Piano Player’s face! If I were a Cast Member, there would probably not be a day that would go by when I didn’t have a smile on my face. It appears that this Cast Member has the same idea, based on the smile on his face as he plays the piano outside of Casey’s! 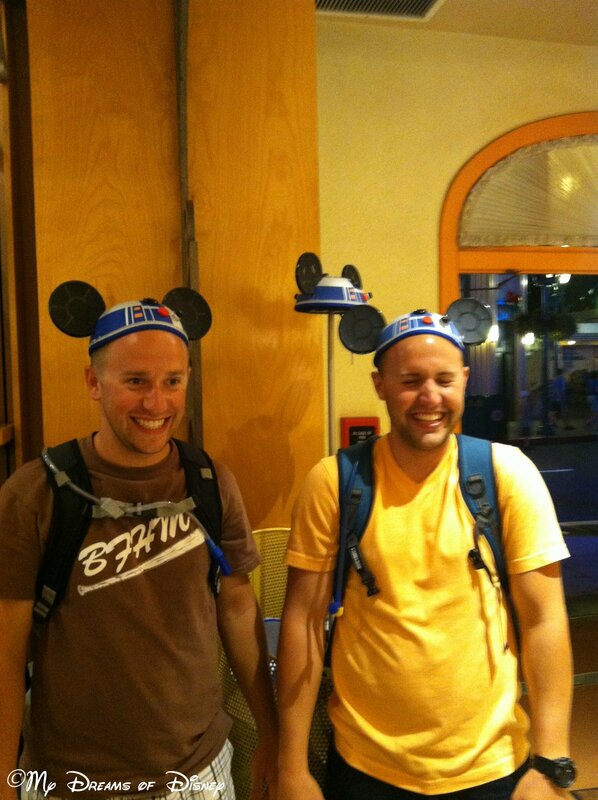 Happiness isn’t limited to little kids — take a look at brothers Kyle and Shane for evidence as they try on their R2D2 Mickey Ears! Kyle and Shane are brothers — Shane married my niece Stephanie this past November. They walk with the Lord, and it is evident that happiness comes in all shapes and sizes! 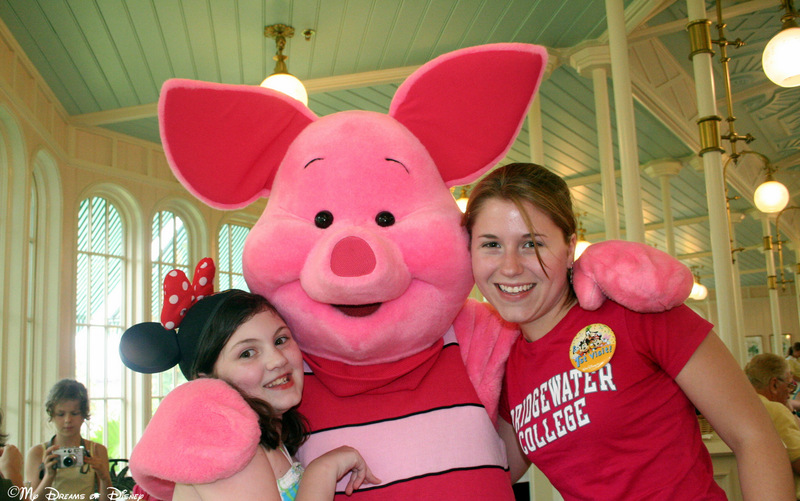 Happiness is cousins Sophie and Stephanie being able to enjoy being at Walt Disney World together! In many ways, it was this trip — the time we took Stephanie with us to Disney World — that started this little blog on it’s journey. The happiness that those cousins shared that week, and Cindy and I did also, was just the start; after that trip, Stephanie would come with us in 2011 twice, and then her happiness meter went through the roof in June, 2012, when Shane proposed to her in front of Cinderella Castle! 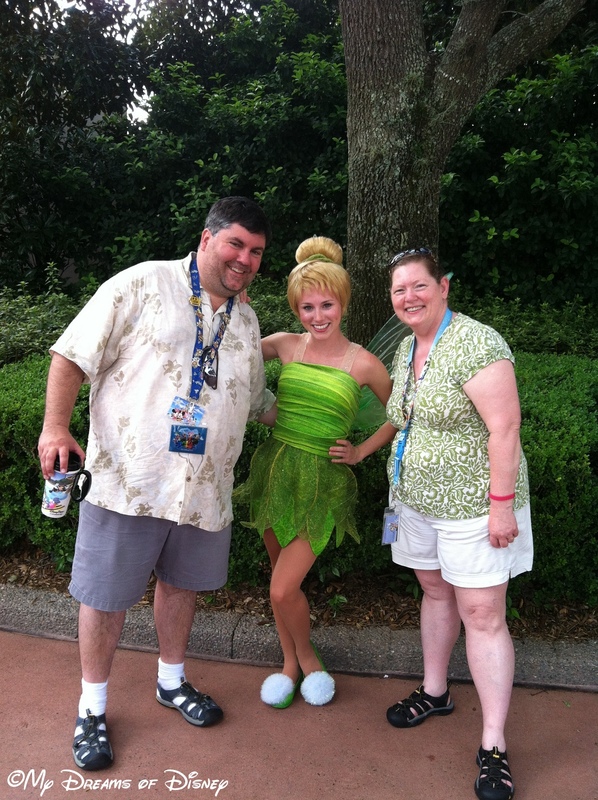 Happiness also belongs to me and Cindy — on this day, we were on our own when we saw Tinkerbell! On this day, we were traveling from Disney’s Hollywood Studios to Epcot through the International Gateway when we saw Tinkerbell there — and there was no one in line! We had never had our picture taken with Tink before, so we did so, and this picture graces the wallpaper of my iPhone to this day. Thank you for joining me on our trip through the Disney Letter “H”! Stop by and see what my friend Deb has for us over at Focused on the Magic! Just click the button below! Wordless Wednesday – My Favorite Disney Transportation! Wordless Wednesday – the Wild Side of Disney! Great pictures! The number one thing that impressed me the first time we visited Disney was the cast members. I was so impressed by their pleasant attitudes and cheerful demeanors. Definitely a lot of happiness in these photos. WDW is such a magical place indeed and it’s hard not to be happy when everyone around you is smiling. So Happy that I know you Mike- you get Happiness just right! Great pictures Mike! I truly love seeing the happiness on your faces in all of these pictures. You have some beautiful memories! Love that you were able to capture Tink for that great picture!! Great! I love all of the different ways that you captured happiness. Happiness says it all!! Just the looks on everyone’s faces! Always love seeing Disney smiles!! Such a great ‘H’ to capture! Next Post: Let’s Get to know Alicia, our new My Dreams of Disney contributor!